The market moves in cycles which are often extreme. We are currently experiencing a market which appears almost exclusively focused upon momentum rather than value, quality or traditional fundamentals. Should investors give up on fundamental value investing strategies and follow the markets’ momentum focused lead? Or is it time to stand strong with a disciplined value investing strategy and think long term? As regular readers of our articles will know, we find the behavioral biases evident across financial markets both fascinating and enlightening, and we seek to learn how these biases tend to recur so our shareholders can profit from them over the long term. One glaring behavioral theme in financial markets today is the overwhelming prevalence of momentum investing – investors are chasing stocks which have gone up a lot which forces these stocks to go up even further, and of course vice versa. We were discussing investing with a few competitors recently and one of them disclosed that the main investment input he looks at these days is a company’s stock price chart – he will only buy stocks trading at or near their 12 month high, and will aggressively sell any stock which starts trading below its 12 month high. The interesting point here is that our competitor’s way of thinking has been consensual market thinking for quite some time now. And as a result, stocks have generally either been going up or down, and the extremities have been unusually extreme in both directions. 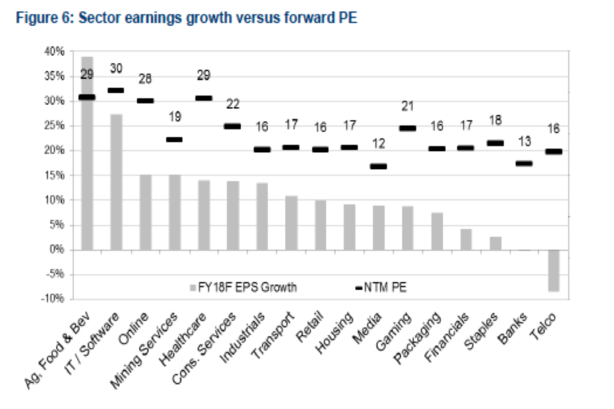 As shown in the charts below, this has led to a situation whereby most ASX listed sectors are now trading at or above their long term valuation averages. However, in our opinion this is misleading. 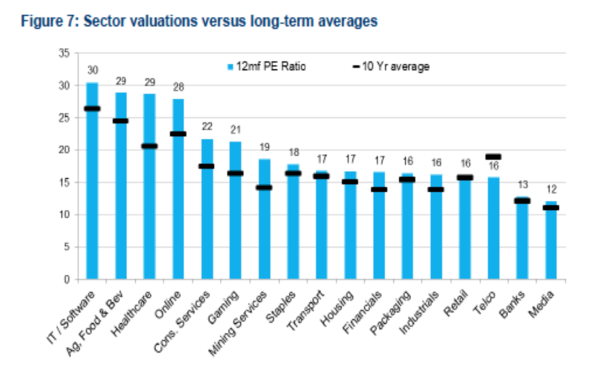 If you dig a little deeper it becomes clear that only a relatively small portion of the ASX listed universe has actually been pushed to extremely high valuations, which has in turn brought up the market and sector average valuations. It is almost as if we have two completely different markets emerging. In our opinion it is becoming increasingly redundant to focus upon the broader market averages as a result. Amidst the market’s momentum obsession in recent years, unusually attractive value opportunities have emerged, particularly at the under-the-radar smaller companies end of the market, where momentum is generally even more binary that amongst the large caps – the market has either been interested or it hasn’t. - Equally, avoiding the companies on high valuations by virtue of their low earnings bases is a key blow-up avoidance step. These ‘concept’ companies with no real earnings history often have significant ‘blue sky’ expectations factored into their valuations which are usually very difficult to deliver on. - A portfolio of these highly profitable, under the radar smaller company opportunities will on average perform very well over the long term as the market increasingly understands the businesses, and their valuations increase toward market and sector averages. These drivers will always remain and thus we expect similar numbers in the next 90 years as Fama and French have uncovered for the previous 90 years. We expect significant long-term upside from investing in a portfolio of the type of under-valued, high-quality micro-cap opportunities referred to in the Fama & French micro-cap value data. Here are three companies currently trading at unusually attractive valuations for the reasons mentioned in this article. Zenitas (ASX:ZNT): A fast growing, high quality healthcare services stock, providing GP, allied health and aged care services, which, based on its market guidance in April, is trading on around 8x 2019 earnings with a long runway for strong eps growth in the coming years. Traffic Technologies (ASX:TTI): Australia’s largest traffic software and solutions company, which has significant exposure to Australia’s increasing infrastructure spend and the fast growing ‘Smart Cities’ thematic, and is trading on around 6x 2018 earnings. Paragon Healthcare (ASX:PGC): A fast growing, market leading distributor of essential healthcare equipment and consumables to hospital and other medical facilities, which, based on its April market guidance, is trading at around 10x 2018 earnings (inclusive of recent acquisitions) despite potential for strong double digit eps growth in the coming years. In our experience, opportunities this extreme are usually short term in nature – if the market doesn’t move quickly to resolve these valuation anomalies, these companies are likely to be acquired. So we have identified that there are some great opportunities at the micro-cap value end of the market at present. Shorter term investors may be grappling with the lack of momentum in these stocks but for long-term investors like us, these opportunities are truly exciting. The key to creating long-term wealth in this sector is to relax and remember you are invested for the long term. Hold strong for the big gains. Disciplined value investing appears to offer a significant opportunity for steady- handed, long-term investors at present. As the herd continues to invest where the momentum is, which is generally in highly valued stocks with high expectations, we are focusing upon the under-the-radar quiet achievers where the upside risk is significant. The tide will turn, and when it does we believe micro-cap value will resume its long-term relative outperformance.